William Bradford of Thorney was born in 1750, owned quarries at Pibsbury, which produced lime for fertiliser, and chartered small vessels to carry Welsh coal to Bridgwater. William married Ann Richards in 1782 and she worked with her husband in running their business, until his death in 1806. Shortly after this she was joined by her son Job (1789-1872) until her death in 1819. Jabez Bradford was born at Thorney on 15 March 1827 and baptised at the South Petherton Wesleyan chapel on 15 April 1827. He was the son of the above-mentioned Job Bradford and his wife Billah, or Bella, (1801-1880) and in the 1841 census merchant Job and Billah were listed living at Thorney with their children; 14-year old Jabez, Anna (b 1829), Job (b 1832), John Wesley (b 1833), Ellen (b 1835), William Theophilus (b 1837), Mary (b 1838) and Watson (b 1840). In the 1851 census Job and Billah were still at Thorney and he gave his occupation as 'Merchant & Yeoman, 110 acres employing 8 Labourers'. Most of the children had left home although their eldest daughter Anne (b 1826) had returned and a new daughter Dorcas (b 1842) was listed. 22-year old Jabez didn't give his occupation. Sill at Thorney in 1861 Job gave his occupation as Coal Merchant while his three unmarried sons Jabez, John and William, now aged 34, 28 and 24 respectively, were all listed as merchants. In 1853 the Great Western Railway line was opened from Taunton to Yeovil and Jabez, although still at this time living at Thorney (also conveniently situated on the new railway line), started a Yeovil branch of the family business. His brother William later joined him in the Yeovil business, and their brother John remained with their father at Thorney. The Great Western Railway came to an agreement with the Bradfords for sidings to be built near Yeovil's new railway station, known as Hendford Terminus. On 26 November 1863, Jabez married Lydia Gaskell Sixsmith (1840-1870). She was born in Oxford, the daughter of schoolmaster, later insurance agent, John Walker Sixsmithand and his wife Lydia. 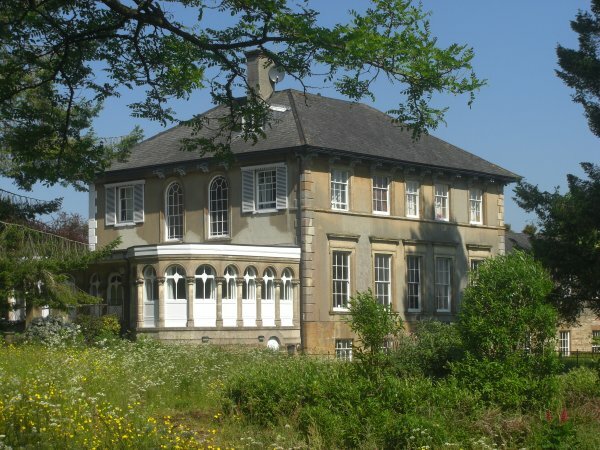 Jabez and Lydia moved to Yeovil where their son Alfred Ernest (1865-1950) was born. Sadly Lydia died in Yeovil during the winter of 1870, aged just 30. In the census the following year Jabez and 5-year old Alfred were living in Hendford - not quite discernible from the census but most likely in one of the cottages in what was to become known as 'Bradford's Yard'. Living with them was a housekeeper and two domestic servants. Jabez gave his occupation simply as 'Corn Merchant'. During the 1860s Jabez was on the committee of the Yeovil Mutual Improvement Society and in the later 1860s he also began to get involved in local politics and was also an active member of the Wesleyan Methodist church. In 1869 he subscribed £100 (around £10,000 at today's value) towards the building of the new Wesleyan Methodist church in Vicarage Street. He was elected to the Town Council in November 1870 and around the same time was elected to the Yeovil School Board. He is known to have owned several properties in New Town and, together with other property owners in the area, was prosecuted because the properties had been built without a proper drainage system - their sewage draining into the Milford Brook. On 10 October 1877, at the Approach Road Wesleyan Chapel, Victoria Park, Bath, Jabez married Annie Bradford Male (1852-1930), her middle name suggesting she might be a cousin? Some 23 years his junior, Annie had been born in East Chinnock (just a few miles west of Yeovil) in 1852, the youngest daughter of farmer Henry Male and his and his first wife Ann nee Rowsell (1809-c1865). Jabez and Annie were to have six children; William Harold (1878-1952), Annie Margaret, known as Madge (1881-1943), Francis G (b 1882), Helen C (b 1884), Frederick KG (b 1886) and Walter G (b 1891). In July 1877 Jabez bought Penn House, with its extensive lands, for £5,400 (in excess of £4 million at today's value). The sale details of 1877 (see below) indicate that Penn House had an entrance hall, dining room, drawing room, morning room, library and WC on the ground floor, five bedrooms, dressing room, WC and housemaid's closet on the first floor, five bedrooms on the second floor and, in the basement, a kitchen and scullery, butler's pantry, large fire-proof muniment room, smoking room, housekeeper's room, large larder, good wine and beer cellars, WC and a coal house. In the extensive grounds were vineries, a pinery, a orchid house, and other conservatories, stabling for five horses and two double coach houses with accommodation over. In November 1880 Jabez was nominated and elected Mayor of Yeovil. He was to serve as Mayor until 1882. The 1881 census saw Jabez and Annie in residence at Penn House with their two children, a cook, a nurse and a housemaid. 52-year old Jabez gave his occupation as 'Merchant - Corn & Timber'. Jabez retired from the Town Council in 1888. A longtime member of the Yeovil Working Men's Liberal Club, he was elected President of the Liberal Club in 1891. In the 1891 census the family were still listed at Penn House. 62-year old Jabez was listed as a General Merchant with his 39-year old wife Annie. His son from his first marriage, Alfred, was also living there 'assisting his father' as well as the five younger children, a governess, a cook, housemaid, nurse and under nurse. In 1892 he was appointed as a Borough Magistrate. Jabez Bradford died in Yeovil on 13 November 1897, aged 70. His will was proved at Taunton the following February with his estate valued at £39,922 14s 5d (around £27.5 million at today's value). Annie continued living at Penn House until her death in the winter of 1830. She was 78. The following synopsis of the development of Job and Jabez Bradford's business empire is 'borrowed' from the Bradford's website. Between 1850 and 1870 branches were opened at Martock, Montacute, Somerton, and Sherborne, and along other railway lines at Yetminster, Crewkerne, Chard, and Ilminster, followed in about 1870 with a branch being opened at Bridport. Although operational for some 120 years, Bradfords were only incorporated in 1893. At some point between 1770 and 1893, it had changed from "Job Bradford and Sons" to "Bradford and Sons". Coal importers were purchased at Seaton, Lyme Regis, Exeter and Weymouth. 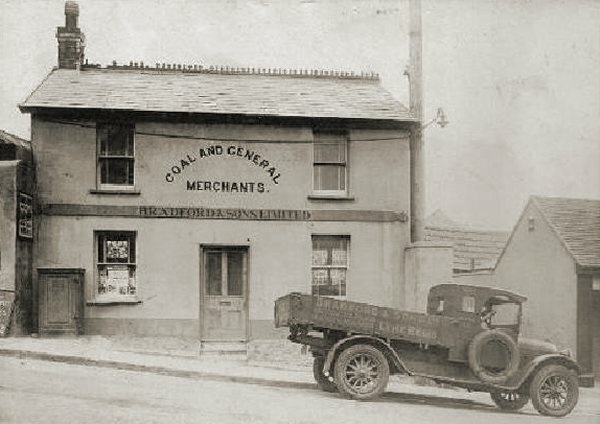 Coal and corn chandlers' businesses were acquired in Bournemouth, Poole, Corfe Castle, Bere Regis and Bridgwater. Later a controlling interest was acquired in a timber importing company, George Hooper & Co, of Bridgwater, to allow the rest of the group to have access to the imported timber. 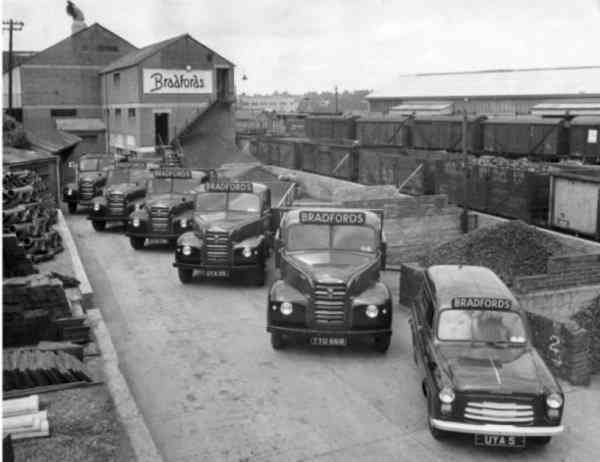 In 1963, Bradfords made a substantial investment in an animal feeds compounding mill and seed-cleaning plant on a green field site close to Crewkerne station but ceased processing its own seed in 1972. The mill was razed in the late 2000s and was developed for housing in 2011 as part of the redevelopment of Crewkerne branch and the neighbouring fleet workshop. The 1970s was when Bradfords added the ‘light side’ of the builder's merchant trade to the range of existing ‘heavy’ products. Modern showrooms opened at Sherborne, Ilminster, Crewkerne, Seaton and Yeovil. 1971 saw a completely new look Bradfords. The small branches were replaced by seven larger-scale branches at Bridport, Crewkerne, Ilminster, Lyme Regis, Seaton, Sherborne and Yeovil. Additional re-organisation was achieved with a Crop Services Division. In 1977, the animal feeds manufacturing business was sold to BOCMS, and the remaining group was restructured, establishing separate trading companies of Bradford's Agriculture Limited, Bradford's Building Supplies Limited, Bradford's Coal Limited, Miller & Lilley Limited, and Burt & Sons Limited. In 1983 new branches were opened at Exeter and Taunton. Slades of Evercreech, was purchased. Snows Timber of Glastonbury was acquired in 1985. The combination of a specialist timber merchant along with the established builders merchants helped to strengthen the group. The acquisition of F.J Reeve, another timber merchant, in Andover in 1996 gave this part of the business reach across the entire South of England. There were further acquisitions in 1990 with the purchase of May & Wills in Redruth and Kemps in Ross-on-Wye. A branch was opened in Ledbury in 1998 along with a further acquisition (Underwoods) in 2000 giving another two branches in Malvern and Worcester. In 2001 BHIS at Redruth was brought into the building supplies network. Quickly followed up with the purchase of CE Curtis in early 2002 adding two branches at Laira Bridge and Plympton and another in Liskeard. During 2005/6 new branches opened in Newton Abbot, Trowbridge and Weston-Super-Mare. In 2007 the company purchased Crendon Timber Engineering Limited; a well-established roof truss manufacturing business and leading provider of roofing services operating from four facilities in Long Crendon, Bristol, Piddlehinton and Castleford. The company purchased W.J. Handrahan & Son Limited an established timber importer and processing business operating from facilities at Kingswinford in the West Midlands and Huthwaite in the East Midlands. The company also purchased Totem Timber Limited a builders merchants in St. Austell. During 2011 ten kitchen and bathrooms showrooms were modernised across branches of Bradfords Building Supplies and in 2013 a new ‘super branch’ was opened in Exmouth and vehicles using the updated branding were rolled out across the group. In 2014-15 the company continued to expand, with five new Bradfords Building Supplies branches acquired or opened, taking the network to 36 branches. The new branches are in Blandford and Wareham in Dorset, Penryn in Cornwall, Moretonhampstead, Devon and Martock in Somerset. Crendon Timber acquired a new factory in Bridgend, Glamorgan and a new site was purchased in Exeter, Devon. In May 2015 the Group acquired YPS a well-established plumbing and heating merchant operating from one site in Yeovil. YPS enabled the Bradfords Group to establish a presence in the plumbing and heating merchant sector and provides a platform to develop further within the market. 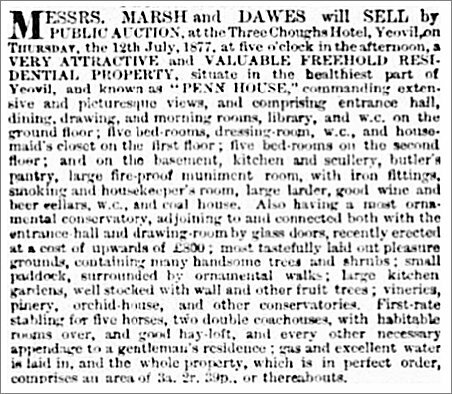 The sale details of Penn House placed in the 20 July 1877 edition of the Western Gazette. At this sale the property was bought by Jabez Bradford for the sum of £5,400 (over of £4 million at today's value). 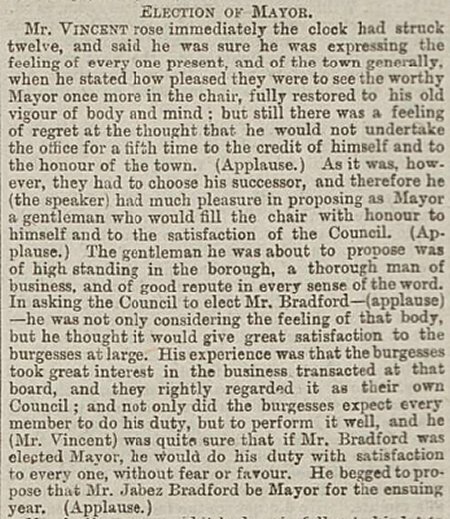 The proposition of Jabez Bradford for Mayor of Yeovil as reported in the Western Gazette's edition of 12 November 1880. Bradford & Sons premises on Hendford, photographed probably in the 1930s. A publicity photograph of Bradford's yard, taken in the 1960s. Penn House from the southeast. Photographed 2013.